“You’ve got a lot going on this week,” said J., after I brought over a little pot of dirt, excitedly showing him the two treasures I had just unearthed. His sentiment alluded to the fact that I had already rescued an Eastern Screech Owl, earlier in the week, that hit my vehicle near my son N.’s school (but that’s another story for another day). Wednesday, though, I had just been minding my own business in the vegetable garden after work, attempting to dig up whatever rogue sweet potatoes I could find that might have matured from re-sprouted second-year vines. As I dug and slowly lifted mounds of soil, I saw something long that almost looked like a dried pepper. After carefully picking it up, I knew right away what it was, despite never having actually seen one in person. I gently set it aside and continued to dig. Within five minutes, yet another one popped up. Wow! This was my LUCKY day. What treasures had I added to my trove, you ask? Sphinx Moth pupae, of course. Some might call them hawkmoths or hummingbird moths, for the way they hover over flowers. I remember the first time I saw one in flight, several years ago, and didn’t even understand what it was. It moved just like a hummingbird but clearly wasn’t a bird. It’s pretty rare to be in the right place at the right time to snap a photo of one in flight, but it’s almost just as rare to dig up a fully formed pupa, especially two of them! This is because the caterpillar can burrow down about a half foot to pupate; and if he burrows in the fall, the plan is to typically overwinter, with the new moth emerging in springtime (at other times of the year, the hatch will occur within only two to three weeks). So unless you are a gardener out digging, and digging fairly deeply in the soil, you are unlikely to ever see one of these with your own eyes. To see two in one dig…almost unheard of. So how did I immediately know that this was a Sphinx Moth? The number one clue is the size of the pupa. It’s massive. My two measured just over two inches! The bigger the caterpillar the larger the house, and I already knew some Sphinx Moth larvae could grow up to 4 inches. What I wasn’t quite sure about was the reason for the little “pepper stem.” I’m accustomed to seeing Monarch and Queen chrysalises suspended from little stems, having hatched many of them, but this made no sense…these pupae were just laying underground. 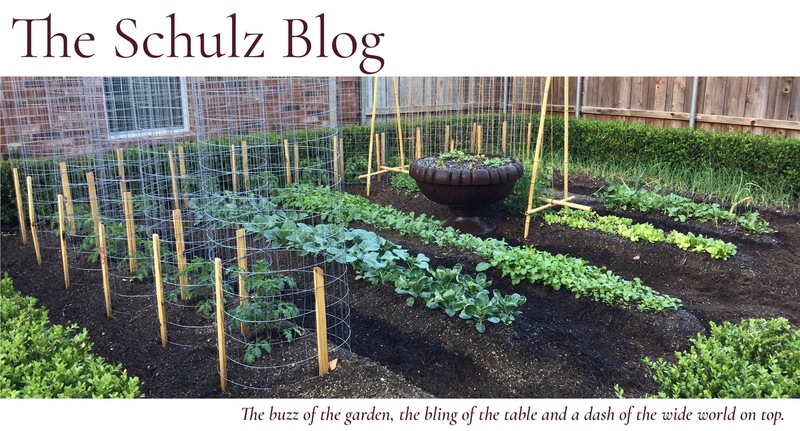 That’s when I did a little research and found Bob Dluzen’s article over at All Things Green. Bob noted that the “stem” is actually the housing for the long proboscis that the moth will form (its nectar-gathering tongue). This makes sense, because many species of Sphinx Moths have a proboscis extending the length of a foot or more! So the top of the pupa will break open and the moth will emerge, headfirst, pulling its tongue out of the hooked casing. Carolina.com actually provides a very helpful diagram on its site about teaching life cycles which further shows all of the parts of the moth beneath the pupa shell; and if you scroll back to the top of this piece and look at my first photo, you can see every part! But there are around 1,100 species of Sphinx Moths. So how can I possibly know which one I have? Through further deduction, I propose that the two guys who burrowed and formed these nice, cozy little houses were likely none other than what we all more lovingly term tomato hornworms. And now the peanut gallery groans. Groans from the crowd arise because these little beasts are experts in devouring foliage on vegetables such as tomatoes, peppers, eggplant and potatoes. So knowing this tidbit of information, and knowing that I just excavated these gems from beneath my sweet potato pile, which was, conveniently, located UNDERNEATH the remnants of our huge yellow pear tomato, leads me to this most probable of Sherlockian conclusions. But now, what in the world to do with them??? Well, since I’m the excavator and this excavator is a “big picture” thinker, and, more importantly, she’s a pollinator proponent, the short answer is…they get a pass. This Universe of ours speaks in mysterious ways, if you are willing to open your ears and listen to it AND you are willing to study it a bit. Wednesday morning, the VERY day of this dig, I happened to come into possession of some Datura seed that I thought I might give a try. It’s the lovely white Angel Trumpet you see in the photo above. It’s also known as Sacred Datura, receiving that distinction because of its history of usage for ritual intoxication in some Native American tribes. If you follow this blog, you know that I am a huge fan of the art of plant sharing, which I’ve coined as #plantsharenow. So to acquire some of these seeds for the first time was a fun happenstance, but to then dig up these pupae was a clear message. So, to the giving we go. Again, if you know me, you also know that I like to practice sustainability, whenever possible, which includes repurposing whatever I can use. My pupae needed to go back into the soil, but I also wanted the chance to hopefully watch this process AND to confirm if my hypothesis on species was actually correct. I found two old poinsettia pots from last Christmas, which are perfect because they have framing around the edges. The framing will provide a vertical structure necessary for the moths to climb up to properly unfold and dry their wings. I filled these with soil, and buried a pupa horizontally in each (because that’s the position I found them in) about 4 inches down. Then I covered each with a mesh sack that cinches at the bottom. I commonly use these for our butterfly habitats both at home and at the school garden where I volunteer. This time of year, as luck would also have it, my yard has no shortage of Elm leaves. So I filled the bottom of a Home Depot® bucket (“Let’s Do This” seeming appropriate) with Elm leaves and placed my pot on top, surrounding it then with more leaves and finally lightly covering the top with even more leaves. This should provide extra insulation now that the pupa aren’t actually underground. But, as J. pointed out, if you’re going to use buckets like this, it’s important to place them under a covered area on a deck or patio so that they don’t fill with rainwater. We don’t need any drownings on our hands! …Manduca quinquemaculata, the Five-spotted Hawkmoth. Beautiful, isn’t she? And maybe, just maybe, I’ll be remembered by the Sphinx for my good heart. If not, I’ll be plenty satisfied if she can just remember me for the Angel Trumpet in my garden…and see fit to pollinate it.